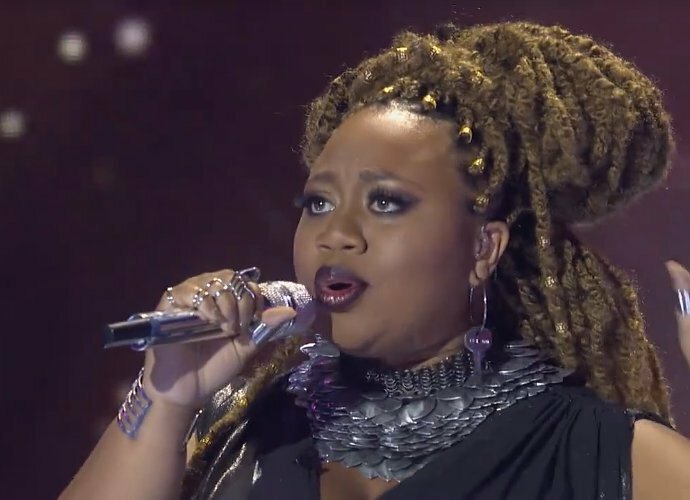 *We all know who should win “American Idol,” but does La’Porsha Renae feel at all like the bona fide front-runner that she is? Viewers of last week’s broadcast saw La’Porsha struggle to connect with the song “Stay With Me Baby,” which has the singer begging her man not to leave their relationship. If such a disconnect happens during the current week finale week, the single mother of 7-month-old daughter Nayalee says she’ll draw on the tools she used Thursday. “With ‘Stay With Me Baby,’ I tried really hard to feel that song,” La’Porsha continued. “I think I did the best I could with it, because I honestly would never tell a woman to beg a man to stay, especially for everything I stand for. The cultural phenomenon that changed the face of television and created some of today’s biggest music stars,kick off a three-night Grand Finale. On Tuesday, April 5 (8:00-9:30 PM ET/PT), AMERICAN IDOL: AMERICAN DREAM, the can’t-miss, 90-minute retrospective will feature host Ryan Seacrest, current and former judges, former IDOLs and contestants and the behind-the-scenes team sharing their personal IDOL memories, as they reflect on what the show has meant to them and how it became the groundbreaking series that it is today. In addition to Seacrest, original IDOL judges Simon Cowell, Paula Abdul and Randy Jackson offer never-before-revealed stories about how IDOL came to be. This is a very special, inside look at the journey that IDOL has taken viewers on during its 15-season run. The following night, America’s most crucial – and last-ever – vote will take place when the remaining finalists battle it out live from Dolby Theatre on Wednesday, April 6 (8:00-9:00 PM ET live/PT tape-delayed). AMERICAN IDOL’s two-part Grand Finale will be filled with surprise appearances and star-studded performances, including winners Kelly Clarkson and Carrie Underwood, along with Jennifer Hudson, who return to the IDOL stage one last time to perform on Thursday, April 7 (8:00-10:06 PM ET live/PT tape-delayed). The farewell celebration will continue, as IDOL pays tribute to the past 15 seasons, the amazingly talented contestants and the millions of fans who called, tweeted, texted and championed their IDOLS, before the 15th AMERICAN IDOL is crowned. In addition to superstars Clarkson and Underwood, Thursday’s final episode will have all-star performances by former IDOLs, including Ruben Studdard, Fantasia, Taylor Hicks, Jordin Sparks, David Cook, Kris Allen, Lee DeWyze, Scotty McCreery, Candice Glover, Caleb Johnson, Nick Fradiani, Ace Young, Allison Iraheta, Amber Holcomb, Blake Lewis, Bo Bice, Brandon Rogers, Bucky Covington, Carly Smithson, Casey James, Chris Daughtry, Clark Beckham, Clay Aiken, Colton Dixon, Constantine Maroulis, Danny Gokey, Diana DeGarmo, Elliott Yamin, George Huff, James Durbin, Jennifer Hudson, Jessica Sanchez, Joshua Ledet, Justin Guarini, Katharine McPhee, Kellie Pickler, Kimberley Locke, Kree Harrison, LaToya London, Lauren Alaina, Melinda Doolittle, Pia Toscano, Sanjaya, Skylar Laine, Tamyra Gray and more, before host Ryan Seacrest announces the results of America’s votes and the final IDOL is crowned.